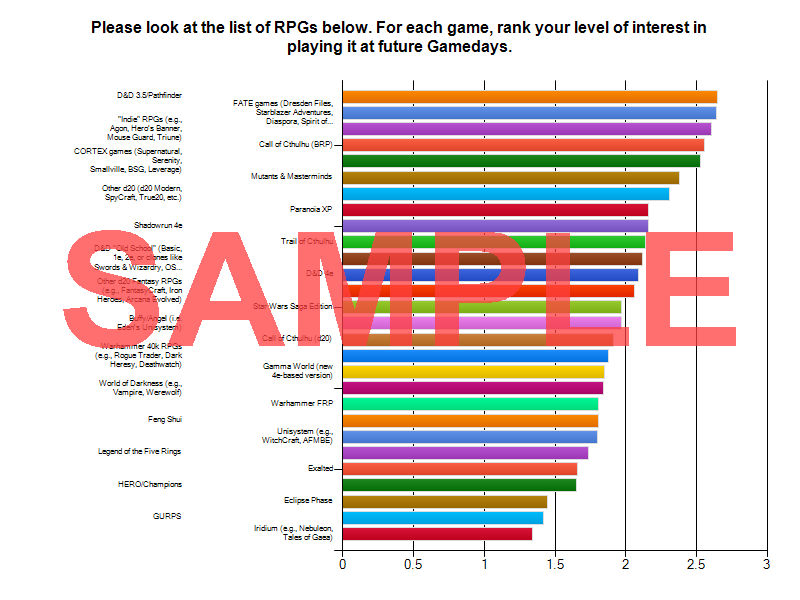 On December 14th, we sent out a survey asking Gameday attendees about the kinds of games they want to play at future Gamedays. We got an 18% response rate (34 responses out of a total 158 addresses on our mailing list), which is not too shabby for a mass mailing. Still, it’s good to keep in mind that the following results represent only a portion of the potential Gameday populace. Grain of salt and all that. The first and most important question asked what RPGs people are interested in playing. 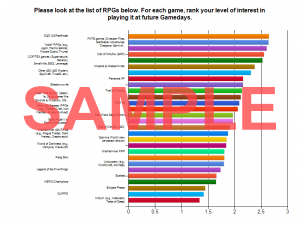 Respondents rated various RPGs on a scale from “Not interested at all” to “Yes, please run this!” While the list presented was pretty exhaustive, I nonetheless overlooked a few games. Deadlands/Savage Worlds was mentioned by two respondents in the “Other suggestions” comment area, but no other RPG was requested by more than a single respondent. Overall, there wasn’t a steep curve as far as the difference between the most-desired and least-desired games; it was a gradual descent. I.e., the ratings for the 11th-15th RPGs on the list were not that much lower than the 7th through 10th. If you are going to run D&D, 3.5 or Pathfinder is possibly the best bet, with “Old School” D&D running a moderate second and 4e a close third. That said, there were actually a lot of respondents (44%) who specifically did NOT want to play 4e. However, I would not shy away from 4e if that’s what you want to run. 4e is too popular overall to ignore. Lots of people want to play Call of Cthulhu, especially the classic BRP edition. Lots of people want to play supers, M&M in particular. I have noticed that supers events have been pretty sparse at Gamedays past. Dresden is hot right now. Run Dresden, and people will flock to your event. There is definitely a contingent of Indie gamers that frequent Gameday. Here are the full results. Unfortunately, since I am using the free version of my survey service, the word “SAMPLE” is deliberately placed over the results table. Still, it’s mostly readable. The next question asked was about genre preference: “System aside, are there particular genres you would like to see more of at Gameday?” Overall, there was no great disparity between any of the options; all genres seem to hold some interest. The “Big Three” were, in order: Fantasy, Science Fiction, and Horror. The “Next Three” were pretty close to these, score-wise: Urban Fantasy, Pulp/Noir, and Superheroes. In general, it seems that any genre is a safe bet. Next, respondents were asked about the maturity of the content presented in events at Gameday. They were given a scale from “G” to “R” (a la movie ratings) and asked what level of “mature content” they were comfortable with. 41% of respondents were comfortable with “R” content, 35% with “PG”, and a little under 3% wanted “G”. Others simply had no preference. Overall, it seems that respondents were comfortable with anything that was not gratuitous, but were not especially seeking out such content. They general feeling seemed to be that as long as the event was not making anyone at the table uncomfortable, said content was okay with them. However, the few respondents who did object to mature content were fairly adamant. So, I think the key learning here is that we all need to be courteous to those around us. As the Gameday FAQ states, it is recommended that you be up-front about the expected age-appropriateness of your event. Next, we asked “Do you like to play board games at Gameday?” The options were a simple yes or no, and the divide was pretty even, though “No” had the edge with 52.9%. When asked to elaborate, there were many different board games mentioned, though it was Descent that got more than a single mention. So, should you run board game events at Gameday? Maybe. You are obviously narrowing your potential audience down, but 50% ain’t bad. 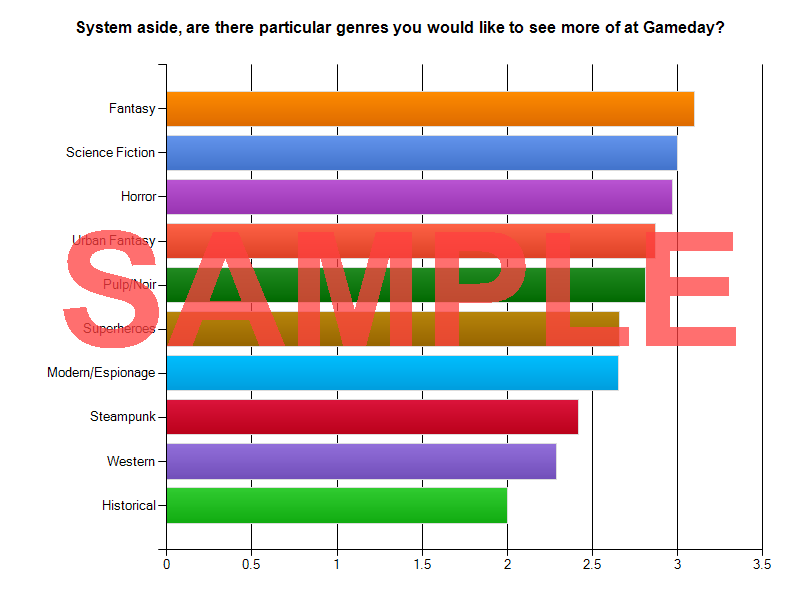 Still, the preference seems to be for RPGs. In the same sprit, we then asked about preferences for other types of events, such as CCGs and wargames. Only 13 of the 34 respondents even answered the question, and among them there was no one type of event that was clearly the winner. More than half of those who answered wanted neither CCGs nor wargames, but rather minis painting, seminars, even “frisbee outside”. The lesson here seems to be that there is very limited interest in events not involving RPGs or boardgames, with the possible exception of minis painting… and I mention it only because I know it’s done well in the past. So, yes, run an event in this category and you are taking a risk. Last of all, our “bonus question” asked if a Gameday Facebook page would be useful to you. 52% said yes, while 38% didn’t have a preference. This tells me that it’s worth a try! Ergo, expect to see some Facebook news in the future. So, there you go. I hope that this information proves useful to anyone with interest in running an event for Gameday. Expect to see this sort of preference survey become an annual ritual. This entry was posted in News, Surveys. Bookmark the permalink. Trackbacks are closed, but you can post a comment.